In the last chapter, we learned the barest elements of Einstein's general theory of relativity. We now need to understand what those elements entail for gravity. The first place to start is the most familiar, the gravitational effects arising near a massive object like our earth or sun. These were the first applications of Einstein's new theory. 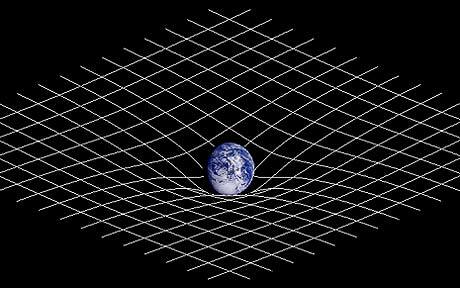 Einstein's theory associates gravitational effects with a curvature of spacetime. 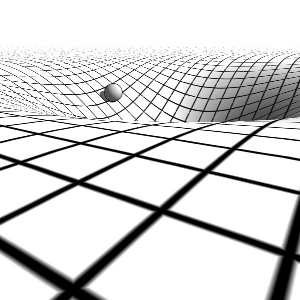 The familiar effects of gravity arise from curvature in the space-time sheets of the spacetime. That projectiles follow parabolic trajectories and planets move in elliptical orbits is recovered almost exactly from the curvature of these space-time sheets. These most obvious manifestations of curvature require time. The curvature in the purely space-space sheets of spacetime, that is, the curvature of our purely spatial geometry, is almost imperceptible under normal conditions. Nonetheless the effect is there. Einstein's theory does say that the geometry of space becomes curved in the vicinity of very massive objects. That is true for the space we know that is close to both the great masses of the earth and sun. However the deviation from flatness in these spaces is so slight that no ordinary measurement can detect it. For this reason, we believed for millennia that our space is exactly Euclidean, whereas it is only very nearly so. These effects are worth pursuing. While they are small in the weak gravity of the sun and earth, they become more pronounced as we approach bodies of more intense gravity or consider the enormous distances of cosmology. That the curvature is even there in small degree in our part of space is of great foundational importance. It shows that the old idea that space has to be Euclidean is wrong empirically. To get a sense of just how close our local geometry is to Euclidean, let us estimate the disturbance to it due to the presence of the sun. Consider a huge circle around the sun that roughly coincides with our earth's orbit. Euclidean geometry tells us that the circumference of this circle is 2π x radius of the orbit. Imagine that we now approach the sun one mile at a time and draw a new circle centered on the sun at each step. The Euclidean result tells us that for each mile we come closer to the sun, the circumference of the circle is diminished by 2π miles. That is the Euclidean result. Because of the presence of the sun, space around the sun is not exactly Euclidean. According to general relativity, for each mile that we come closer to the sun, the circle does not lose 2π miles in circumference; it loses only (0.99999999)x2π miles. What does this slight disturbance to the geometry of space do to the straight lines of the spatial geometry? It causes them to deviate slightly from what you would otherwise expect. The deflection is extremely small. However, as we will see below, it turns out to be one of the earliest effects actually measured. This representation of how the geometry of space is affected by the presence of the sun is quite adequate. It is limited to intrinsic curvature. However another representation is possible. We can capture the deviations from Euclidean flatness in the space through extrinsic curvature. To do it, we imagine that the surface lives in a higher dimensioned Euclidean space and that its intrinsic curvature comes about from its extrinsic curvature in that space. We will pursue this since it leads to one of the most familiar images associated with general relativity in the popular literature. To make things concrete, let us imagine that we will build a real model out of some flexible sheeting material whose extrinsic curvature will display the geometry of space around the sun. To build the model, we take the largest circle and lay it down as a ring on a flat, Euclidean bench surface. We then move inward one unit distance in radius to the next circle. We lay down a second smaller ring with the appropriate circumference and connect the two by the flexible sheeting of the model. In the case of Euclidean geometry, the circumference of the second circle will be reduced 2π units of distance, matching the behavior of Euclidean circles on the table top. Thus it will lie flat on the table, to produce the two circles shown below. The two circles would be joined by a flat ring of the sheeting that comprises the model. In the case of the non-Euclidean geometry, when we move inward one unit of distance, we arrive at circle whose circumference has lost less than 2π units of distance. As a result, it will have a greater circumference than the circles of the table surface one unit of radius closer to the center. That means that it will not lie flat on the Euclidean surface of the table. If we tried to lie it flat on the table surface, we would have to crumple the sheeting connecting the two circles. Since we want to avoid crumpling the sheeting, we would have to let it pop up above the table, as shown below. The effect is greatly exaggerated in the figure. The amount the surface would pop up would be undetectible, if it accuractely modeled the deviations from Euclidean space in our part of space. 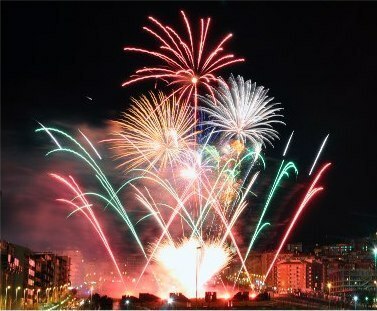 However the qualitative effect is correct. If we were to model the geometry of space very close to a very massive body, then the effect would be more marked. We continue building our model by adding more circles nearer the sun, connected by sheeting to the circles farther out. What would result is more popping out of the sheet, until we have a familiar funnel shape. The figure below inverts the funnel in keeping with the standard presentation of the model in the literature. The model is an embedding diagram of the geometry of space near our sun. That is, it recovers the intrinsic curvature of a two-dimensional sheet of space-space by the extrinsic curvature of a model surface bending into a higher dimensional, Euclidean space. The model captures an important geometrical fact about the space around our sun--that it is no longer exactly Euclidean. 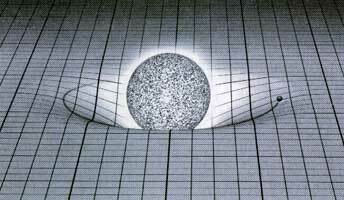 It is one of the most frequently built models in the context of general relativity. However it is misleading in two ways. First, since it is an embedding diagram, we should not be misled into assigning any physical reality to the higher dimensioned space in which the surface is modeled. It is introduced solely for our ease of visualization. In fact the diagram is a step backwards in that it is a return to the old way of visualizing curvature as a bending of a surface into a higher dimensioned space. While it might be a useful aid to visualization, it is factually false. There is, as far as we know, no higher dimensioned space into which the surface bends. 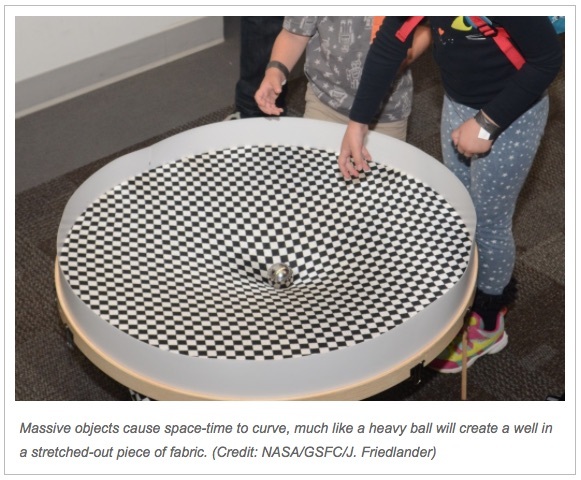 Second, a common way of encapsulating Einstein's theory is to roll marbles across the model and suggest that gravitational attraction somehow comes from the resulting deflection of the marble's roll. From the discussion above, you can see why that is misleading. The gravitational deflection of ordinary objects falling in the vicinity of the sun is due to the curvature of the space-time sheets. What the model shows is the curvature of the space-space sheets and that curvature is so small as to have negligible effects on the motions of ordinary objects. The model is often described as a rubber membrane model and the picture is of a massive object sitting on a rubber membrane distorts the membrane. Just about the only thing right in the rubber sheet model is that the surface of the membrane is similar to the surface of the embedding diagram. Almost everything else is misleading and has to be imagined away. There is no gravity outside the membrane, for example, pulling the mass down so it distorts the membrane. Most importantly, there is no curvature of the space-time sheets of spacetime represented, even though that curvature is responsible for the familiar gravitational effects. From the NASA website "100 Years of General Relativity." 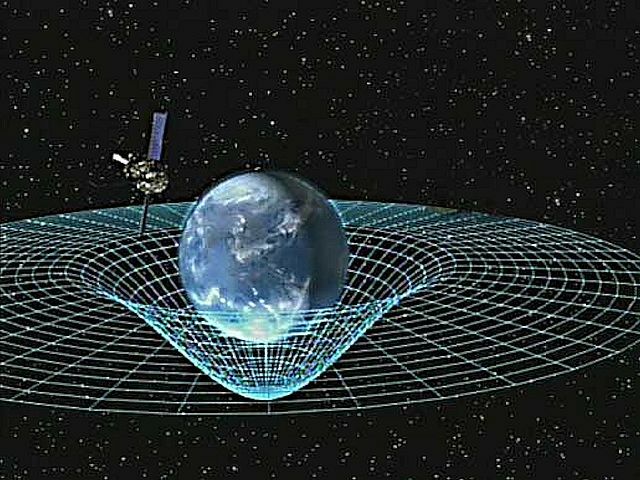 "At its most basic, general relativity is a way to describe gravity by attributing it to the curvature of space-time that occurs in the presence of massive bodies. Massive objects cause space-time to stretch. One way to think about it is to imagine stretching a piece of fabric between a couple of people, and then plunking down a softball in the middle. The ball will make a dent in the cloth. Then if you roll a small ball across the fabric, it will seem to be attracted to the softball, though it's really just following the dent in the cloth. It's not a complete picture of how gravity and general relativity work, but it's a good way to start to wrap your head around Einstein’s theory." One of the consequences of Einstein's theory will have special importance to us. Gravity is a curvature of spacetime that affects all free fall motions. Light propagating is one of those motions. So just as massive bodies like planets and comets are deflected toward the sun, so also is light. One of the characteristics of a Minkowski spacetime and the more general spacetimes of Einstein's theory is that they have a light cone structure. It maps out the fastest trajectories for causal interactions. Since gravity affects light, gravity will also affect this causal structure. The effect of gravitation is to tip the light cones in the direction of the gravitational attraction. This can have some very interesting consequences, such as new regions of spacetime causally isolated from our region. These arise in the theory of black holes and we will see more of them later. Shortly after Einstein complete his theory, he announced three empirical tests that he believed established the theory. Two had yet to be done. They were: I. Mercury; II. Light Bending; and III. Red Shift. Einstein's theory predicted the same, but added that the axis of the ellipses of the planetary orbits would advance very slightly. That means the axis would rotate slowly in the same direction as the planet's motion. In Mercury's case, the advance would be about 43 seconds of arc per century. This amount of advance is really very small. To see this, note that there are 60 minutes in one degree and 60 seconds in one minute. So 43 seconds of arc is very much less than a single degree. It would be impossible to use a sharp pencil and a big sheet of paper to draw two intersecting straight lines that intersect at 43 seconds of arc. They would be so close that they would appear like one line. Yet this is the extra advance Einstein's theory predicts over the time of 100 years. That so called "anomalous" advance had already been observed but no final explanation had been agreed on for it. When Einstein discovered that his theory predicted this elusive 43 seconds of arc, it might well have been the greatest scientific moment of his life. He recalled having heart palpitations, being unable to sleep and a sense that something inside snapped. Of course the matter was more complicated than the above gloss suggests. Even in Newtonian theory, the ellipse of Mercury's orbit was expected to move by over 400 seconds per century due to the perturbations of the other planets. That means that the gravitational attraction of the other planets pulls Mercury off the simple elliptical orbit computed in their absence. Adding in the effects of these perturbations, Newtonian theory could account for all but about 40 seconds of the motion of the axis of Mercury's orbit. Until Einstein was able to explain it exactly with his general theory of relativity in late 1915, this small discrepancy did not seem to be very worrisome. It was only afterwards that explaining it became a sine qua non for any new gravitation theory. 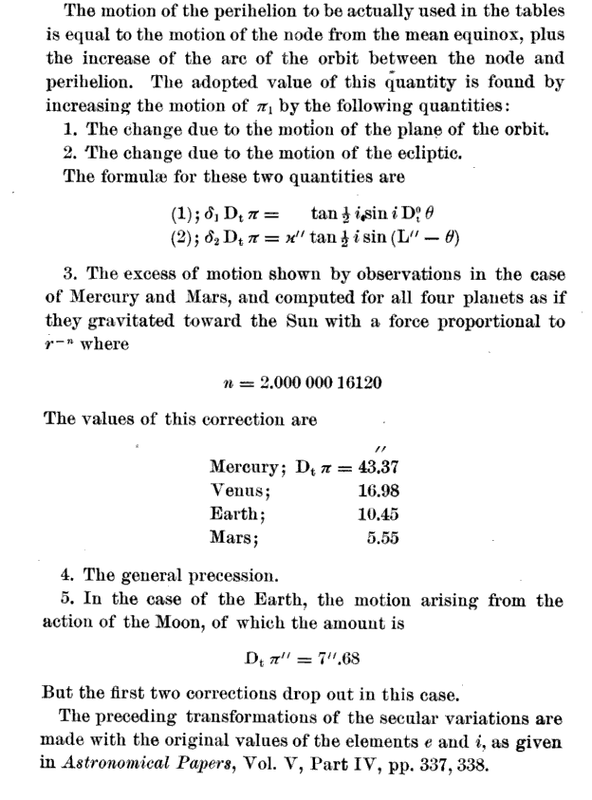 Here's a contemporary account from Simon Newcomb's authoritative The Elements of the Four Inner Planets and the Fundamental Constants of Astronomy: Supplement to the American Ephemeris and Nautical Almanax for 1897. Washington: Government Printing Office, 1895, p. 184. Note that Newcomb allows that the anomalous motion of Mercury could be accommodated if Newton's law of gravitation was not exactly an inverse square law. That is, he considers the possibility that the force of gravity does not dilute in inverse proportion with (distance)2 but with (distance)2.00000016120, a supposition due to the astronomer Asaph Hall. We might wonder if this is an admission that no hypothesis within the existing system is expected to accommodate the anomaly so that an alteration of fundamental law has to be contemplated. Or, more likely, is it just a working astronomer noting the simplest way to develop a rule that will allow prediction of planetry motion? Einstein's recovery of the anomalous motion of Mercury turned out to be a turning point in gravitational physics. Until Einstein's success, recovering precisely the anomalous motion was not regarded as an essential test of a theory of gravity. Prior to November 1915, gravitation theories could fail the test with impunity. In November 1915, that changed. From then on, if a new theory of gravitation was to be taken seriously, it had to match the performance of general relativity. It had to recover the anomalous motion of Mercury. Einstein's explanation of the anomalous motion of Mercury has also exerted a strong influence in philosophy of science. It was a striking achievement. 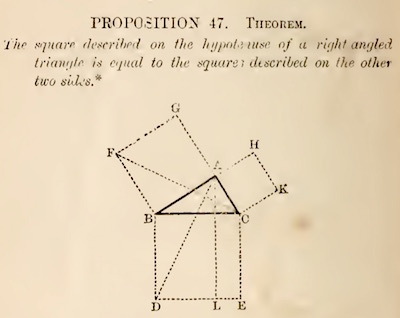 Einstein developed a theory of gravity using notions from then obscure mathematics. There was no reason to expect that it would recover Mercury's motion. There are no parameters that one can adjust in the theory that would guarantee it. So when Einstein's theory recovered the anomaly exactly, it was a powerful moment. Philosophers of science have used it for a century as a wonderful example of something done right. Just what that thing done right is depends on which philosopher you ask. It might be an illustration of how a good theory can be exposed to a severe test and pass. Or it might show us how good explanations work: the anomaly in a motion is now explained by a novel proposal for the character of gravity. "No parameters to adjust"? Hall tried to accommodate the anomalous motion of Mercury by assuming that gravity does not dilute inversely with (distance)2. Instead, he assumed it dilutes inversely with (distance) raised to the power of some-other-number very close to two. It was a foregone conclusion that there would be some-other-number close to two that would do the job. It was really just a matter of tuning Newton's inverse square law to recover whatever anomaly may come your way. If the anomaly is bigger, you tune to it by selecting a power further from two; it is small, you choose a power closer to two. What happened next? Hall's proposal disappeared quite quickly since it did not accommodated other, smaller anomalies in the motion of the other planets. According to Einstein's theory, light, just like any other form of matter, is affected by gravity. That is, light also "falls" in a gravitational field. Just as a comet's trajectory is deflected by the sun when it passes nearby, a ray of starlight grazing the sun would also be deflected or bent. When we (or our camera) look at the star, we presume that the path taken by the light is straight. The effect of the bending of the light, then, is to make the star appear to be located in a slightly different position in the sky. The effect is quite similar to a mirage in the desert. Light from a small patch of blue sky grazing the ground is deflected slightly upwards towards us. We look back along the lightray and misplace a small patch of blue sky as located on the ground. It looks like blue water. The deflection is measured as the change in apparent direction of the star from the earth; that is, it is measured as the angle between the direction in which we see the star and the direction in which we expected to see the star. Einstein computed that the deflection would be about 1.75 seconds of arc. This is a very tiny angle.There are 360 degrees in full circle. Each degree is divided into 60 minutes or arc and then each minute is further divided into 60 seconds of arc. Measuring this tiny a deflection in the position of a star at the edge of the sun's fiery disk is quite difficult. It turns out that we must wait for an eclipse of the sun to block out the confounding effect of the dazzling light of the sun. After some failed attempts, an English expedition, headed by English astronomer Arthur Eddington, reported successful observation of the deflection for the solar eclipse of May 29, 1919. Until then, Einstein had merely been a leading member of the physics community. The reportof the success was picked up by the press and Einstein was launched as a famous public figure. 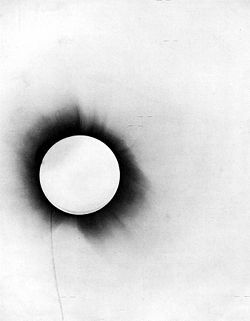 One of Eddington's eclipse photos From the New York Times, November 10, 1919. Curiously, the light bending effect turns out to be similar to one already expected in Newtonian gravitation theory. Under Newton's corpuscular theory, light consists of rapidly moving corpuscles with mass. As they propagate through space, they fall towards massive bodies like planets and stars. As a result, both the speed and direction of the light changes. In 1801, Johann Georg von Soldner had already computed the purely Newtonian effect of the deflection of starlight by the sun. The figure shows the basic idea of the Newtonian calculation. The light from a distant star would normally propagate in a straight line in Euclidean space. However as the starlight propagates past the sun, it is pulled gravitationally towards it. The resulting fall bends the light ray away from the straight line of the Euclidean geometry of space. The amount of the deflection is measured as before by the change of angle for the apparent position of the star. General relativity allows for the same effect. A ray of starlight propagating past a massive body like the sun will also fall towards the sun. The amount of the fall is measured by the angular deflection of the star's apparent position and turns out to be the same deflection as predicted by Newtonian theory. That it is the same--or at least so close that the difference does not matter--may seem surprising. It is really a familiar result. Instead of starlight, imagine a stone released from rest above the sun. In the first few moments of its fall, both Newton's and Einstein's theory must give us almost exactly the same result. For otherwise, the two theories would not agree on simple facts like the speeds of fall of bodies above the surface of the earth. While light propagating past the sun is moving very rapidly in the horizontal direction, the motion of fall in the vertical direction towards the sun is very small. The vertical fall is just like that of the stone. Both Newton's and Einstein's theories will agree on it. So far we have nothing new. What leads general relativity to make a different prediction from Newtonian theory is the geometric effect described above. Ordinary space in the vicinity of the sun has a slight curvature that leads to small deviations from Euclidean expectations. Light propagating near the sun will fall towards the sun, deviating from straight line motion. However the straight lines from which it deviates are themselves slightly bent. More precisely, they are bent in relation to what we would expect if the geometry of space around the sun were Euclidean. The net effect is two bendings that are added together. First, straight lines are bent from Euclidean expectations; second, the rays of starlight are bent by the fall of the light towards the sun. It turns out that the angle of deflection of each of these effects is the same (and the same as the Newtonian angle of deflection). As a result, general relativity predicts a deflection of starlight that is twice as great as that predicted by Newtonian gravitation theory. Early versions of Einstein's theory did not include the curvature of the geometry of ordinary space around the sun. This led to a close call in the testing of the theory. A minor variation on this effect arises if the deflecting body is massive enough to bring together the light that passes on either side of it from a luminous body behind it. Then the deflecting body acts a kind of lens, focusing the light. In the figure, the observer would see two images of the same object. In the case of perfect alignment, the observer would see a ring of duplicated images. 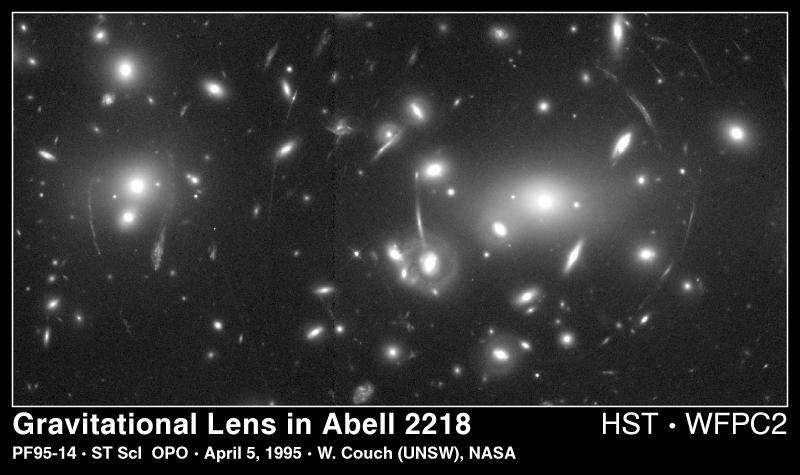 This effect, known as "gravitational lensing," has only recently been observed. While Einstein did not discuss the effect in his publications, it turns out that he had computed it in a private notebook in 1913. Dowloaded from http://hubblesite.org/newscenter/archive/releases/1995/14/image/a/format/web_print/ February 15, 2007. According to Einstein's theory, informally speaking, time runs slower closer to massive bodies. That means that natural clocks in the sun run slower than the same clocks on earth. Of course there are no ordinary clocks in the sun. But there is something much better. Excited atoms emit light in very specific frequencies and our measuring the frequency of that light is akin to our measuring the frequency of ticking of a clock. Any slowing of those atomic clocks would result in a change in the frequency of light emitted from the sun. Einstein's theory predicts a very small degree of slowing of clocks in the sun. It manifests in the light from the sun being slightly reddened for observers watching from far afield on the earth. The red shift for light from the sun is merely 0.00002%, which proved extremely difficult to detect. The effect was found later in the light from stars far more massive than the sun. The figure shows light climbing out of the stronger gravitational field of the sun towards the earth. The difference between the curvature of a space-time sheet and space-space and how each reveals itself to us. What the rubber sheet-like embedding diagram shows (and does not show). The three famous tests of general relativity. Copyright John D. Norton. February 2001; January 2, 2007, February 15, August 23, October 16, 27, 2008; February 5, July 20, 2010, February 25, 2013. December 29, 2015. February 22, 2017.